Fake Food Watch: GMO Foods: Do Americans Have the Right to Know What They Eat? GMO Foods: Do Americans Have the Right to Know What They Eat? 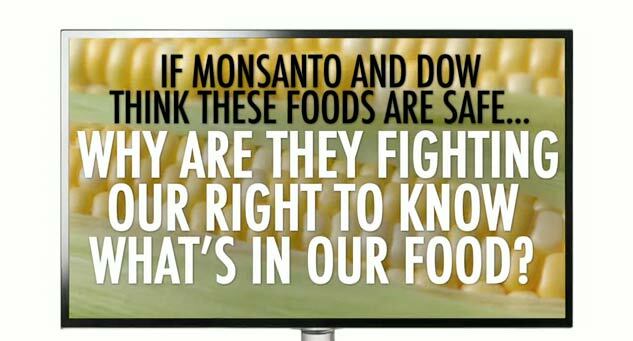 Do you have the right to know what's in your food, and how it's been processed or grown? Do you have a right to info to make religious and ethical decisions about your meals? Decisions about your health? More than 100 countries agreed in 2011 to label foods that contain genetically modified organisms. In 2012, 50 countries have mandated labeling of GMO foods. "Unlike people in the United Kingdom, Germany, France, Italy, Ireland, Australia, South Korea, Japan, Brazil, China, Russia, New Zealand and other countries where labels are required, Americans don't know if the food they eat has been genetically altered." 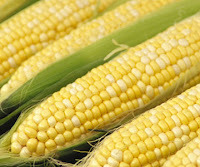 More than 1 million Californians petitioned for the GMO proposition to be on the 2012 ballot. And polls show voters strongly supporting this measure, by a margin of 3 to 1. A British newspaper reports of Proposition 37 that "89% of Republicans and 90% of Democrats want genetically altered foods to be labeled." But the Who's Who of Modern Industrial Food... Monsanto, DuPont, PepsiCo, Coca Cola, Nestle USA, Campbell's, Kellogg, J.M. Smucker, General Mills, many more... are battling Prop 37 with powerful political might and hundreds of millions in advertising. These Fake Food purveyors firmly believe Americans shouldn't have the right to know about what they eat. Genetically modified foods are produce or animals in which changes to their naturally-occurring DNA have been made by genetic engineering techniques, such as mutations, insertions, radiation, chemical treatments, and complex cloning methods. "This relatively new science allows DNA (genetic material) from one species to be transferred into another species, creating transgenic organisms with combinations of genes from plants, animals, bacteria, and even viral gene pools. The mixing of genes from different species that have never shared genes in the past is what makes GMOs and GE crops so unique." In the U.S., almost all non-organic corn, sugar beets, soybeans, rice, canola, and cottonseed oil is genetically modified, and by large industrial food corporations. One or more of these ingredients is present in virtually all processed food sold in U.S. markets and grocery stores today, from cereals, cookies, and crackers to ice cream, peanut butter, oils, deli items, and, well, everything. that a huge percentage of non-organic produce is GMO food. "This genetically engineered apple... contains a synthetic gene that dramatically reduces production of polyphenol oxidase, the enzyme responsible for an apple's browning... This new patented apple promises financial gains for the owner of the technology, but offers no real benefit for consumers or other producers, only risk." "
GMO beef, poultry, and salmon manufacturers are salivating to sell their new animal products to Americans, and are pushing hard for USDA approval. But so far, only GMO produce has been approved for sale to Americans households. 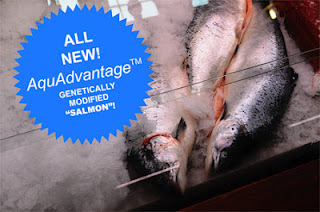 Perhaps the closest to government approval is the AquaAdvantage transgenic salmon (pictured above), a new, fast-growing Atlantic salmon species created by artificially combining growth hormones from an unrelated Pacific salmon with DNA from the anti-freeze genes of an eelpout. The foremost concern about GMO foods is that no long-term studies exist to corroborate lobbyist and industrial food corporation claims about the health safety and benefits of genetically modified foods.... by universities, by the government, or by scientists other than those employed by the manufacturers and patent-holders. "In Canada, a landmark independent study by Canadian doctors published in the peer-reviewed journal Reproductive Toxicology found that toxin from soil bacterium engineered into corn to kill pests was present in the bloodstream of 93 percent of pregnant women. "There is a great need for additional research because there have never been mandatory human clinical trials of genetically engineered crops, no tests for carcinogenicity or harm to fetuses, no long-term testing for human health risks..."
"A 2008 Austrian study found that GM corn has a damaging effect upon the reproductive system. Professor Don M. Huber of Purdue University has discovered a completely new, unknown organism within genetically modified crops that can cause miscarriages in farm animals." 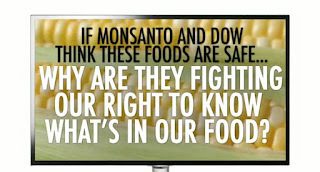 The Right to Know: Yes on 37 campaign, which states, "The same corporations that said DDT and Agent Orange were safe have now put millions of dollars into the campaign against our right to know what's in our food." Their efforts have been endorsed by an impressive roster of public health and food safety organizations, and by many hundreds of food manufacturers, most of them family-run small businesses. "90% of mothers and 88% of fathers favor requiring labels for foods that have been genetically engineered or contain genetically engineered ingredients. "That’s an overwhelming majority of parents concerned with what they are feeding their families. And why wouldn’t we be? As parents, we want the best for our children, and ensuring they have a nutritious diet is the key to their success and wellbeing. "We can’t be left in the dark concerning what’s in our food system. As parents concerned for our children’s futures, we must demand mandatory national labeling of GE foods. We have a right to know!" Just Label It's advocacy has been also been endorsed by a lengthy list of credible organizations and concerns food businesses. Do Americans Have the Right to Know What They Eat? I believe they do... and as a Californian, I plan to vote YES on Proposition 37. "We urge you to fully review the facts, law, and science, and side with the American public by requiring the labeling of genetically engineered foods as is done in nearly 50 countries throughout the world. "FDA has a clear opportunity to protect a consumer's right to know, the freedom to choose what we feed our families, and the integrity of our free and open markets with this petition." The Food and Agricultural Organization of the United Nations reports that some GMO foods have been engineered to be more nutritious in terms of mineral or vitamin content. Not only does this help you get the nutrients you need, it can also play a significant role in battling malnutrition in the developing world. The United Nations advises that vitamin A-enhanced rice is helping to reduce global vitamin A deficiencies. This is the Monsanto line. What they don't want you to know is that genetic modification is a reckless random process that causes thousands of mutations up and down the genome, that animals fed on GMO feed sicken and die, that independent scientists who wish to do studies on their seed have their careers ruined if their findings show these products to be unsafe. There are many, many respected doctors and scientists that oppose Monsanto, and for very good reason. Monsanto has a long history of suing non-GMO farmers whose crops have been contaminated with their GM pollen. Their agenda is all to do with making massive amounts of money! In actuality, it has nothing whatever to do with helping anyone! They are out to eliminate all seeds they do not own and create of world totally dominated by their monocultures. Monocultures are extremely vulnerable to disease and pestilence. This poses a very real threat of world famine if Monsanto were to succeed.